Welcome to this week’s Wizzy News – our weekly roundup of news and events at Wisborough Green Cricket Club. Plenty of games to report on this week with our Firsts, Seconds, Sunday team, under 14’s, under 12’s and under 9’s all in action. Anyone who has been involved with cricket has probably come across situations where rain or bad light stops play. This week it was a little different in the Seconds game against Pullborough on Saturday. 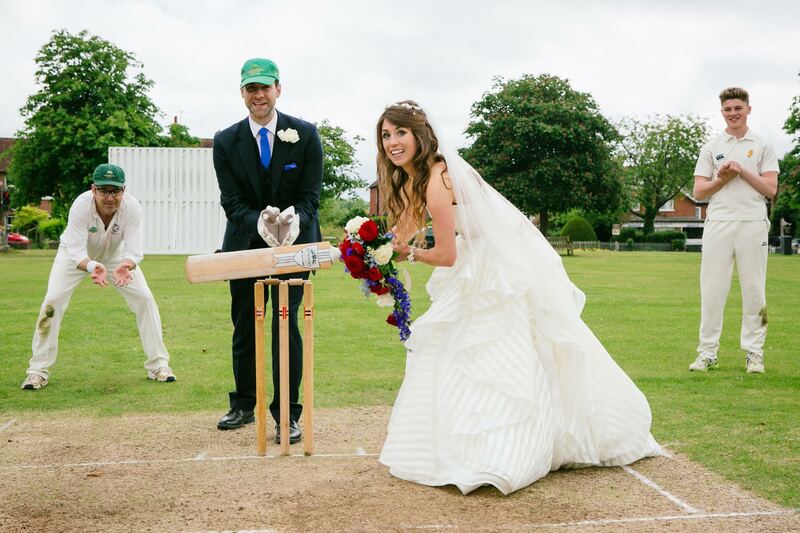 Who were we to argue with cricket lover and beautiful bride Lisa Hulbert, who just had to step up to the crease on her special day. Heartiest congratulations and best wishes to Lisa and Jonathan on your new life together. This week its the batting stats. To view the detailed batting stats click on the ‘batting statistics’ link at the top of the Playcricket page or Click here for a shortcut to see the batting stars. As with the bowling stats you can view the stats for specific teams, and then sort by ‘runs scored’ , ‘highest score’ or ‘average’ by clicking on the appropriate column coloured in blue. Click here to see who has been selected to play for the senior teams this weekend. -Farmer and Doddy both take 3 wickets as game goes to the wire. -St Andrews batsman gets out and launches kit further than he hit the ball. Green let the game slip after Pullborough limited to 83 for 4 after 18 overs. – Joshie leads the way with the ball with 2 wickets. – Nappers unbeaten 56 in vain. -“He just won’t shut the front door” is something along the lines of what she said…..
Wilbert Overton shakes off the keeper gloves and stars with the ball – finishing with 3 for 12 off 3 overs. Coach praises team for positive all round performance. If there is anything we need to know you know where to find us. Have another great cricketing week. This week the 1’s visited St Andrews Burgess Hill hoping to continue their recent run of form. The side had a few changes from the previous weeks victory over Barns Green however. Byron Napper was on his 12th holiday of the year, James Rainford was in hiding from the RSPCA whilst DJ and Jack Sizzey-Carter went to the FA cup final. Into the side came Ricky Etheridge, Nick Scott Payne and Jimmy Francis. The home side won the toss and elected to bowl first. The wicket looked decent enough so Green weren’t to worried about having a bat first up. Francis and Carter opened the batting and the score raced to 15, thanks in the most part to one bowler chucking 10 wides down the leg side. However he then shocked Francis by bowling one on the stumps. Francis (1) missed with the attempted drive and Green were 1 down. Jack Carter (8) followed soon after when he got a good ball that lifted off a length and was well caught in the slips. A lazy drive straight to cover accounted for Self (6) and suddenly Green were in some bother at 32 for 3. Ben Thatcher joined Ricky Etheridge at the crease and the two began to slowly repair the innings. The two showing the patience that was required and putting some real value on their wicket. The pair added 56 before Etheridge was bowled for 30. From there wickets fell with regularity though. A combination of some poor shots and some decent bowling. 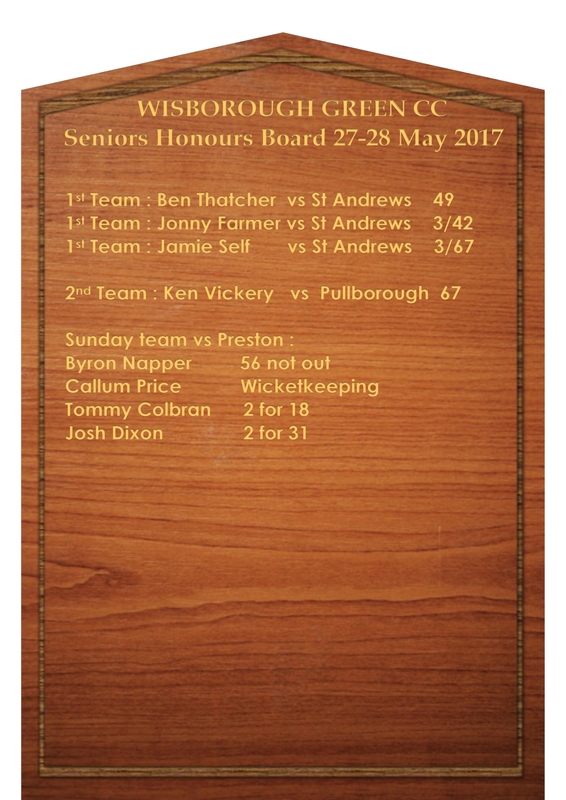 Thatcher eventually fell for 49 and Jonny Farmer (26) was the only other batsman to make any real impression on the score book. Green were dismissed for 167. A total probably 20-30 runs short of a par score. After tea, which is now the leading contender for away tea of the season, Green set out to get early wickets and try and defend their slightly lower than hoped for total. Farmer and Thatcher opened the bowling and bowled well early on. They were unfortunate, beating the bat on countless occasions but never quite finding the desired edge. St Andrews had 44 runs on the board when Farmer finally struck. He followed that with 2 more wickets to give Green a glimmer of hope. The next pair added 63 for the hosts and looked to have closed the door on a win for Wis. Self came into the attack and got the breakthrough though and with the door slightly ajar Green began to sense that all was not yet lost. The pressure on the hosts was beginning to tell and the middle order were playing some rash shots. Tim Dodd and Self were combining well and wickets began to tumble. Much to the disgust of one batsman who, when dismissed, managed to launch his bat, helmet and both gloves in different directions over the boundary before storming into the changing rooms to the great amusement of most of the other people at the ground. The score was 154 for 8 and things were on a knife edge. However, a few big swings by numbers 9 & 10 managed to just see St Andrews over the line. Sadly defeat for Green in what turned out to be a close game. Oh how different things could have been with those extra 20-30 runs on the board. Batting was ok in patches, and our target of 180 would have been enough to win the match. The Pulborough skipper won the toss and chose to bat on a good wicket, if a little damp from the earlier rain. The Wizzy team had been changing all week, with call ups and cry offs and so it was a delight to have Hugo in to opening the bowling attack and the skipper (a little like Clive Lloyd spoilt for raw pace) elected to bowl the lightening JP up the hill. The two bowled straight and kept things tidy and when the dangerous Wood was dispatched early things were going well. Chriss was getting frustrated but a drop and two missed run outs eased the pressure before he was undone by JPs slower ball. This was a sign of things to come. A little more ruthlessness in the field could have changed the match. The Pulborough skipper settled in but the introduction of Leon brought immediate results, getting rid of the hard hitting Dunger early. Jacob Ball was brought on and bowled well for someone who usually is a keeper and when Leon was brought back on and got their skipper with one that stayed low Pulborough were 83 for 4 after about 18 overs. What was needed now was control from the bowlers to frustrate the batsman, and sharp fielding. Sadly we reached a stage of the game when neither of these were forthcoming. The new batsmen were allowed to settle in, were given enough bad balls to tickle over the score and as they got their eyes in were allowed to score far too easily. Wides and no balls accounted for 24 extras and the fielding with one or two notable exceptions (Leon and Jacob) got sloppy with another 2 or 3 catches going begging and a few misfields. Well batted Pulborough, but we had left ourselves a mountain to climb. The batting order was designed to mix youth with experience, starting with Ken and Tarni; who had been in good form so far this season and then interspersing the talented youngsters with senior heads. The skipper saw in his mind’s eye a 100 from one of the openers, some good 20 and 30s from some of the others and then either himself or Frank stabilising the ship lower down the order and bringing home a glorious victory. Well, all I can advise is don’t bet any money on his visions! Tarni was undone in the first over Hugo followed almost immediately. Jack looked good against some good bowling before being run out in a comedy confusion. The skipper was in and out in a flash and the innings was in tatters at 30 for 4. Jacob played a lovely little cameo for 14 but the side needed some hard bitten edge. Kenny was the only one on the day to have it. He and Frank put on a respectively 30 or so for the 6th wicket and Kenny went onto make a well-deserved 67. Really well batted. 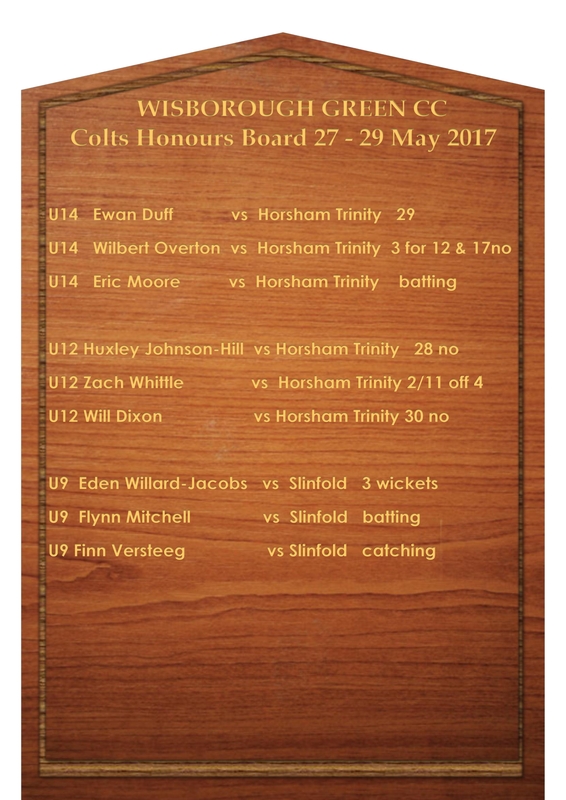 He ran out of partners, the tail wagged a little as Pulborough went through their bowling options and JP and Callum added valuable runs for the final wicket which allowed for the accumulation of points and some respect. More discipline in batting and bowling was required. We played with 5 teenagers in the side and I am sure they will all grow and develop over the season, but there were some good lessons to learn from Pulborough who were altogether more ruthless, we need to start with the basics and build from there. Thanks to Peter for umpiring and Rob for scoring, your presence made life a lot easier. Onwards and upwards next week, a new day and a new chance to shine. Wizzy G welcomed Preston Park CC (PP) to the green for the first time, on an afternoon with a yellow warning for rain forecast, which did not fail to disappoint. With the 40/40 match scheduled for a 2pm start time, the PP captain rucked up at 1.56pm along with the other half of the team. This was the half of the team fasting for Ramadan, and what can only be considered a smart move to not expel anymore calories or hydration than necessary by turning up 4 minutes before game time. The toss was done quickly, which was won by the PP skipper, Umair, who decided to have a bat. With it generally being customary to open with seamers, the skipper, Chris Francis, was struggling for said seamers. Luca was suffering from a dead leg after Saturday’s football match and Farmer was complaining of a sore back from either Saturday’s bowling exploits or from Self performing a “Gorilla Press Slam” on Farmer in the early hours of Saturday morning. The Reverend, Self, seemed the obvious choice from the top end and did not disappoint, bowling tidily and giving little away. From the bottom end, Joshie asked for the new ball before the match, and so the skipper granted him his wishes. Having bowled a great line and length the first few overs, Joshie tossed one up above D. Preston’s eye line. Tempting him to come down the track, Preston played and missed, and Callum did the rest, rapidly whipping off the bails. Great work by the youngsters. A brief dousing of rain kept the players off the field for 10 minutes, after which we reconvened for another couple of overs, in which time the Reverend picked up a well-deserved LBW and Joshie clattered the middle stump of the danger man, Mohsin. With the PP innings at 31-3, a proper downpour ensued. The heavens opened and rain came gushing down at a fair old pace for 40 minutes, which saw a picturesque river form in front of the pav and multiple puddles/ponds appear on the green. This gave ample time for tea to be consumed, and in my mind, Sunday tea of the year so far. With PP chomping at the bit to get back out there, the covers were removed to uncover a rather soggy wicket. The covers had not done their job at all, aside from keeping a small area dry at the Vickery end of the wicket. The green was given an hour to dry before the captains and groundsman decided to get the game under way again, with overs being reduced to 25-a-side. The Reverend and Joshie bowled out their 5 overs, and what lovely spells of bowling they were. With the top 3 batsmen in the hutch, the skipper turned to Dan Vickery to help add a few runs to the board. Initially, he did not disappoint, whistling a beamer past the batsman’s nose first ball and a full toss that was duly dispatched the next. Vickery sharpened up his act quickly though and nipped out 2 quick wickets. His tight bowling also caused a kamikaze run out, which the skipper pounced on with a heavy left boot, to then gather and unleash a dainty underarm to Callum to take off the bails, who made light work of the poor throw. Whilst Vickery was causing mayhem one end, Tommy Colbran was doing an equally good job the other. After being unsuccessful in his first over, he proceeded to bamboozle the PP skipper in his 2nd over, bowling him round his legs. The rather sizeable, Khan, then came to the crease. After seeing off the first ball, he decided to slap Tommy for a four then six. Naps was put back on the boundary to see if Khan had the minerals for a 2nd successive six. Tommy floated a similar delivery up, Khan duly replied, and Naps ran around the boundary to make a difficult catch look rather easy. With PP on 74-8, from 15 overs, the skipper decided there was no other option but to bowl himself to try and get the score to 3 figures. This initially didn’t go to plan, with Saeed tickling one behind to Callum. However, after a few fours and a couple of questionable wides, one of which was batted back to the bowler, the score moved on to 101. Farmer then closed out the innings, with Abdul slicing one just over the slips and Jimmy running back to take a good catch over his shoulder. With tea already taken, Wizzy set about the target with the Sizzler and Jimmy opening the batting against the pacey, Khan. If the ability of the PP batting line up was questionable in parts, the bowling certainly wasn’t. The opening pair saw off Khan’s 3 opening overs well. The Sizzler then decided to take it to Khin, battering him for a couple of fours before being adjudged caught behind. The Sizzler was not best pleased, but was on his way. Enter Napper at 3. Jimmy soon followed, having played a glorious cover drive balls before, he went in similar fashion to the Sizzler with a snick behind. Callum strolled in at 4. Recently back from a week in Greece with the Mrs, Naps really looked the part. With his bronzed skin glistening in the evening sun and rejuvenated barnet peeking out his helmet, he carried on his early season form with the bat, working the ball to all parts of the ground. Young gun, Callum, having kept so well in the first innings, batted exceptionally well in the 2nd innings too, playing with a nice straight bat and rotating the strike well. Despite the 2 whippets scampering well between the wickets, the moist conditions weren’t helping the run rate. That was until Naps took the game to Umair, smashing him for 3 four and a 6 in the 16th over, taking the score nicely onto 64-2. The 2 ticked the score over well until Callum decided to try and launch Saeed back over his head, but unfortunately missed the straight delivery and was on his way for a well-made 15. With just over 5 an over required off the last 5, the skipper came to crease. Unfortunately, despite some lusty swings of the blade, he failed to put bat on ball frequently enough. More scampering between the wicket continued between these 2, leaving 7 required off the last over. Unfortunately, Francis took the majority of the strike for this last over, and with 3 required to win off the last ball the skipper could only slap the ball back to the bowler, and Wizzy were left an agonising 2 runs short of the opposition total, finishing on 99-3 and Naps stranded on 56 not out. A disappointing result, but in my mind a really good day’s cricket had in the adversity of torrential rain early on and it was a real miracle to get a full match in at all. Some really good performances were seen, Naps with an excellent 56*, Joshie bowling a great opening spell picking up 2 excellent wickets, but my MOM has to be Callum for his faultless performance behind the stumps and mature knock against some good bowlers. Lastly, thanks to Leslie for volunteering to score, our illustrious President and Groundman for allowing the game to carry on, Luca hobbling around the field despite injury, tea ladies Emma and Jo for an exceptional tea and Dan stepping up last minute when our 11th man went AWOL. 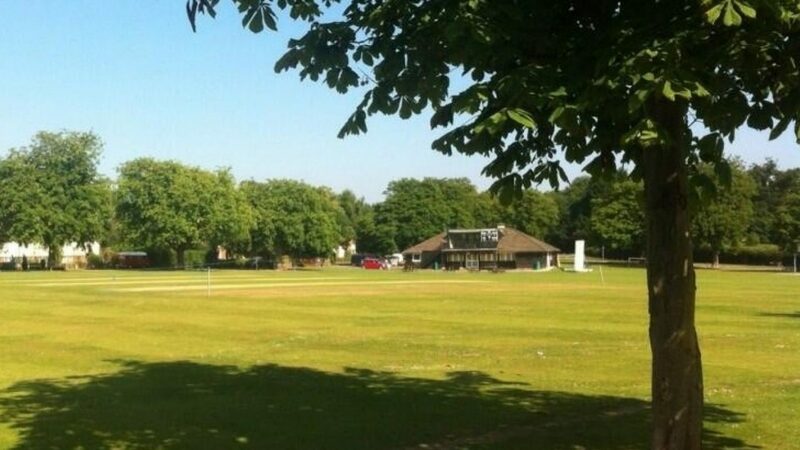 Next Sunday, 4th June, sees the green welcome our old friends, the Flycatchers, where we hope for a minimum of sunny intervals rather than flash flooding. Bank Holiday Monday saw the Under 9’s travel to Slinfold Cricket Club. An overcast evening with the skies threatening, Slinfold won the toss and elected to bowl first. Dexter McCullen and Joseph Reed opened the batting and did a great job putting on 21 . Eden and Georgina followed, also batting very well adding another 24 to the total. Arthur Mustill and Finn Versteeg continued the good work with the bat adding an additional 28. Flynn Mitchell and William Reed were the final pair and batted and ran between the wickets very well adding 49 to the total. A superb team effort with the bat and Wisborough completed their innings with a very formidable 332 off 16 overs. Slinfold found the going tough against some great bowling and fielding from Wisborough Green. There were many highlights in the field including a great catch from Finn Versteeg and all the Colts fielded with great enthusiasm. Wisborough Green took 11 wickets in total against only 1 wicket in their innings. Congratulations to our leading wicket taker Eden who had 3 wickets fall in her spell of bowling. All the Colts bowled exceptionally well with a great deal of accuracy. In the end Wisborough Green ran out winners by 101 runs scoring 332 off 16 overs vs Slinfold’s total of 231.